Have a dry erase marker handy? Simply outline your reflection in the mirror, and step away to examine the shape. If mirror tracing is difficult, try taking your own headshot using a digital camera or webcam. For super-precise results, use your computer’s design software to trace your face in the photo. While it’s not an exact science, determining your face shape can help you discover new style choices. 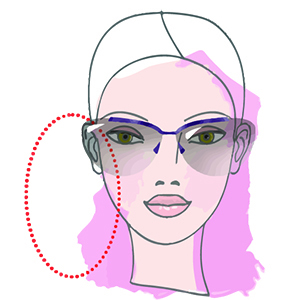 To soften your jaw line and create the illusion of length, look for round and oval frames with upward curves and contours. Choose frames with corner flourishes or pops of color to soften sharp features. Semi-rimless, oval, and cat-eye frames will flatter your square-shaped features, while sharp points, metal tips, and more elaborate wings take classic frames to new extremes. Avoid small, round frames and choose high or mid-height temples to create the illusion of a longer, slimmer silhouette. 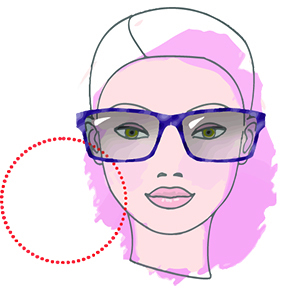 More angular, geometric frames will also add balance and definition to softer features. Squared frames with straight top lines and bold strokes are the perfect complement to the soft features of a round face. To balance your features and add width below your eye line, choose round or oval frames with upward curves and low temples. 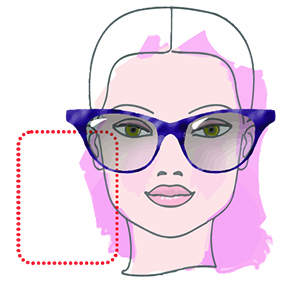 Avoid exaggerating the widest parts of your face with decorative frames or strong top lines. Want a fresh off-the-runway look this year? 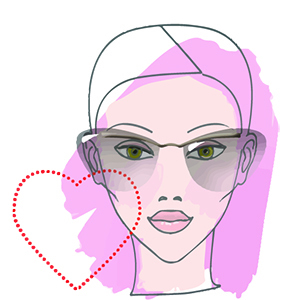 Try rounded frames, circular lenses, low temples, and 70s-styling—all perfect looks for the heart-shaped to explore. Wider frames with strong top lines will help your face appear shorter and broader, but because your face shape is suited for just about any frame, don’t feel confined by any singular style. The contrasting top lines of vintage brow line frames will balance out an oval face. Experiment with bold geometric shapes, relaxed cat-eye lenses, and everything in between.